$124.99 & FREE Shipping on orders over $59. 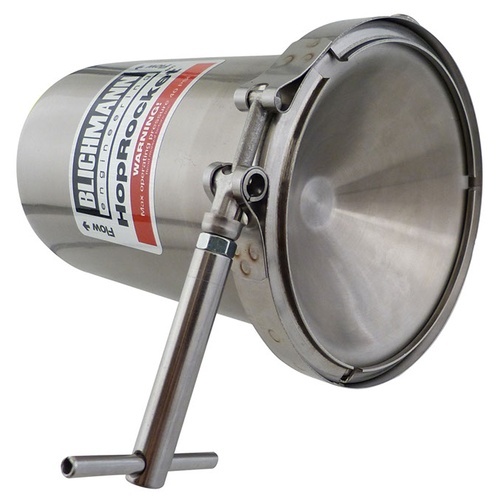 The Blichmann HopRocket™ is a great tool for all hop-heads. 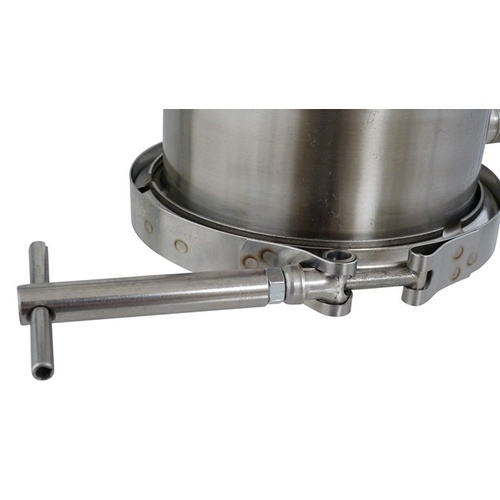 Mainly used as a hop back, but has also been used inline in dispensing draft beer (Randal). The HopRocket can fit up to 3oz. of whole leaf hops to add that extra hop kick to any beer! Pressure tight up to 40PSI! 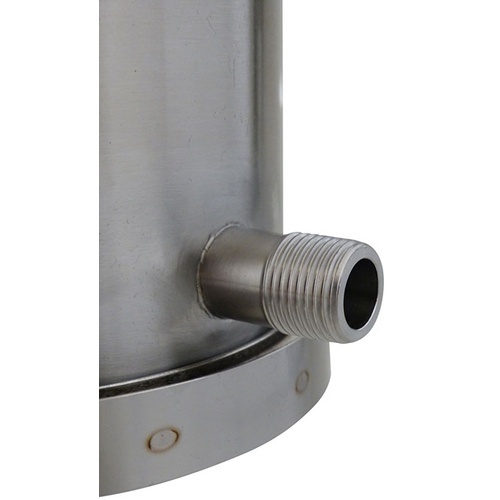 Uses 1/2" NPT connections for a universal fit! My son wanted it for his home brewing. If it's 100% stainless steel and silicone gaskets - why the Proposition 65 warning? BEST ANSWER: Hello Jason - It is likely due to the gasket. Maybe the sticker, or packaging, or the ink the instructions are printed in, or that it is used to make beer. I have been working on ways to build my own hop rocket from the many designs found on the internet. I have found that most either don't hold enough leaf hops, don't stop material or clog easily, are fragile, or leak at some point. This unit is well designed, sturdy, easy to clean (well, sort of) and it does the job nicely. I highly recommend the investment, especially if you are a hop nose freak like I am. My last recipe for an IIPA was boosted by adding Mosaic cryo hops at flame out, followed by 2 oz of leaf Mosaic right before the counterflow chiller. What a difference! You can use this as a hop rocket (blast your wort though it at the end of the boil with a pump) or a Randle (have beer from a keg go through it when serving). The latter gives more aroma for the first 10 pints then you're into weird Hop flavor territory. Construction is rock solid. Your technique will make the difference. Don't expect amazing Hop forward ales until you dial in your processes. This requires careful cleanup after each use. The construction makes this simple. I use wet and dry leaf hops and does a great job of filtering and adding hop aroma. Takes a little time to load it and cleaning after use. 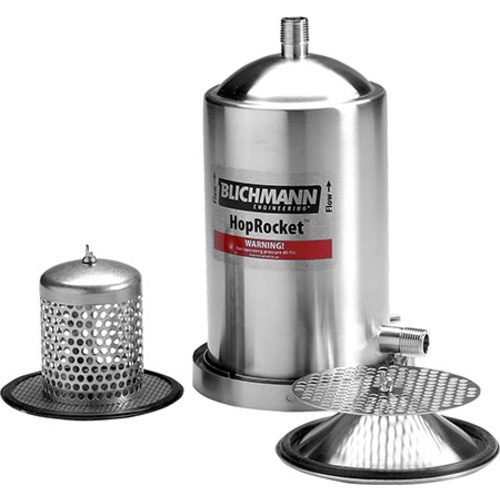 A hop rocket may seem like overkill but it really works well as a filter before your Therminator plate chiller with about 3ounces of rice hulls inside.It helps prevent those unwanted clogs and enhances chilling times. I brewed a 70 IBU IPA that I wanted to be very hop forward. I hooked up the hop rocket in hops that it would take this brew to the next level. Sadly hops were about the same. The beer was quite clear so maybe the extra filtering helped. Anyone want to buy a used hop rocket? 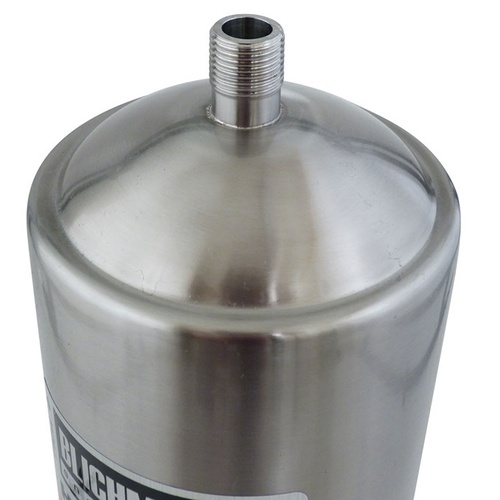 I use this on all of my IPAs, and pale ales, and I've even been experimenting using it on other beers not only is it great to transfer hop flavor and aroma to your beer it also acts as a great filter before passing through your plate chiller. I use this device for every IPA and Pale Ale I make. It really does make a huge difference. 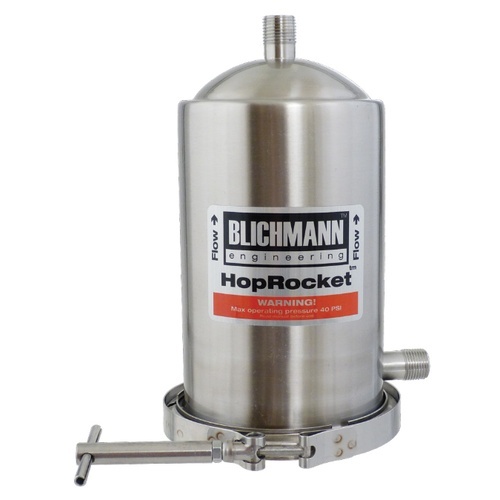 Ideally use with a pump in a Kettle -> Pump -> Hop Rocket -> Chiller configuration. While it is easy enough to clean, it does make a little mess when disconnecting as a lot of wort remains inside after use. It also gets really hot - so let it cool before cleaning. Not that I expect any other hop back different in these areas, just important to mention. easy to use. easy to clean. Just attached some quick connects, and boom! Amazing hop aroma. Highly recommend for taking your pale ales and IPAs to the next level!